Buy Dennis Downing's new Dark Tower inspired CD now!! One word, one simple word, jumped into my head when I popped this little beauty into my CD player: WOW! A simplistic word to say the least, but all encompassing. Jesus... why hasn't someone come up with the idea of a Dark Tower soundtrack before this? I'll tell you why. Good things come to those who wait. Now mind you, this type of music (New Age, or so I'm told) isn't going to make the Billboard's Top 10 List of the year, but it's what I'd call "acquired listening". You don't stick this collection of synthesized aural dreamscapes into your car's CD deck and go turnpikin' down the interstate lanes, or pop it into your boom box when you have those latenight patio parties and you just want to get down... but you DO place it in your home audio system just before you start reading any of the Dark Tower books. This collection of mood altering scores just drowns you in that "other worldly" feeling, and makes you want to dive into the books to continue the experience that is The Dark Tower saga. However, this changes nothing. It still puts one into the mood of all things Dark Tower. Of the eleven tracks, there are a few that really stick out at me... ones that are absolutely exceptional for that cinematic feeling one wants when entering the pages of another world like those of the Dark Tower. "On the Shore of the Western Sea" just put me right in Roland's boots as he made his journey along the beach to find the door of The Prisoner. The seaguls cawing and ocean waves rolling were just the perfect touches for the music that made me think of rising and setting suns over the horizon of an anicent and unknown ocean. "Reaping Fair" is one of those little dancing tunes that actually makes you feel like you're back in the medieval days, dancing around the may-pole in the town square and being festooned with reap charms, and (oh, yes!) reap kisses! You'll get a real "back to Mejis" feeling in this one, to be sure! "Thunderclap" for some reason makes me think of armies marching to meet each other on the battle field -- soldiers preparing their armour and swords, and waving their banners high, to do some unimaginable battle... in a land of darkness and thunder, where clocks run backward and the graveyards vomit out their dead. "Court of the Crimson King" is just exactly what the title infers... use your imagination for this one -- or better yet, just listen to the track! We don't really know who the Crimson King is, or what his court will look like, but if you listen to this track, you'll certainly get one hell of an errie feeling; I'm actually in the court of the Crimson King... One of the best on this CD to be sure! 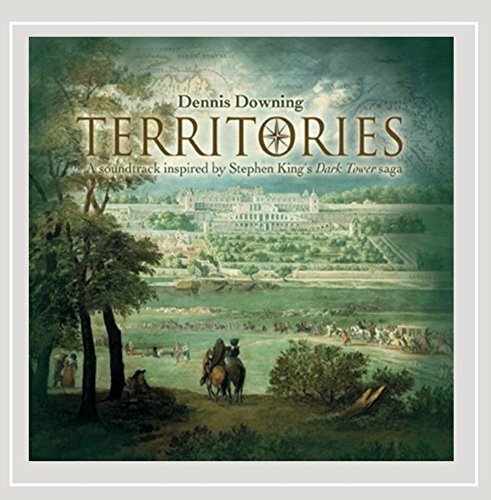 The website that was developed to help musician Dennis Downing put forth his creative ideas for this epic soundtrack can be found at www.dennisdowning.net, and there are loads of images, background stories, and clips of each song for those of you who would like to hear and see a little sample of this fantastic CD. I highly encourage you Constant Visitors of the DTC to purchase a copy as soon as you can, because it's one hell of a way to help subdue those pangs and blues for something new from the Dark Tower books until Wolves of the Calla arrive in bookstores beginning November. Lastly, I want to congratulate Dennis Downing for creating a masterful soundtrack, and for putting together the time and effort to took to bring this forth to all us Dark Tower Junkies. I'm grateful that Dennis sent me this CD to review here on the DTC because although at the time of this review I'm half-way through Wolves of the Calla, it gives reading anything Dark Tower just that extra little "oomph" to put you in that other world.